We will jointly review your requirements and agree the most appropriate and cost effective implementation programme to help realise your objectives. Whilst not an exhaustive list our experience has shown that focus on the following areas will develop leadership and enhance team working skills and have a positive impact on critical business metrics such as safety, quality, productivity, cost, delivery, people motivation and customer satisfaction. Fishbone cause and effect diagram (Ishikawa) provided a structured and systematic brainstorming approach and visual display of root cause problem solving diagnostics. 5S (see diagram on right hand side) is part of visual management and implementation of 5S, and is often seen as the starting point in the development of improvement activities to ensure a company’s survival. Implementation of the five pillars of Sort, Set in order, Shine, Standardise and Sustain will provide benefits such as raising quality, lowering costs, promoting safety and encouraging reliable deliveries to build customer confidence. 5S also promotes visual management incorporating performance monitoring KPI’s. The 8D process provides a rigorous method of investigation and resolution of non- standard performance issues including containment action and root cause investigation; it is equally applicable internal and customer identified quality issue. Single Minute Exchange of Die: SMED methodology is an effective process for reducing set-up times and hence reducing change-over times between product lines or batches by externalising some of the changeover activities, eliminating waste and standardising the operation. Value Stream Mapping (VSM): This process of visually charting the specific activities/processes, is one of the fundamental ways of reducing or eliminating the activities not directly contributing to ending customer satisfaction with applications across the supply chain. The process is equally applicable to offices and services in addition to the workshop. Kaizen or continuous improvement is the structured, team based approach to improvement within the workplace focused on the elimination of steps or wasteful activity. Visual Management objective is to provide a workplace where all employees understand and manage their own work in a safe, clean, organised environment that fosters open communication, pride and continuous improvement. To be effective it needs to answer the questions: who, what, when, where, why and how of an area or process. Standard Operating Procedures: the definition and adoption of a step by step “best current method” aimed at reducing the variability of the process and ensuring that optimum efficiency is maintained- particularly important in training new operators. 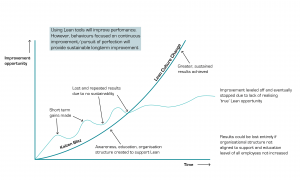 Takt Time: Is one of the key principles of lean, it sets the beat of the organisation in synch with customer demand, balancing the workload of various resources, identifying bottlenecks. Takt time is calculated by dividing the net available time per day by the customer demand per day. Overall Equipment Effectiveness (OEE): A composite measure of the ability of a machine or process to carry out value added activity linking % time machine available x % of maximum output achieved x % quality output. Total productive maintenance (TPM): Extends Preventative maintenance to review of the complete equipment life cycle and consideration includes the operator, product, process and the environment. The objective is preventing breakdowns rather than responding to them and often includes cascading responsibility for monitoring and implementing routine maintenance to the production staff. 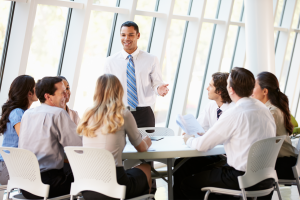 Team briefing: proven to be a cost effective method of communicating with and motivating employees, carried out to a structured format with input and exchange at all levels can provide valuable feedback to senior management. A rigorous step by step process to achieve efficient workplace organisation. 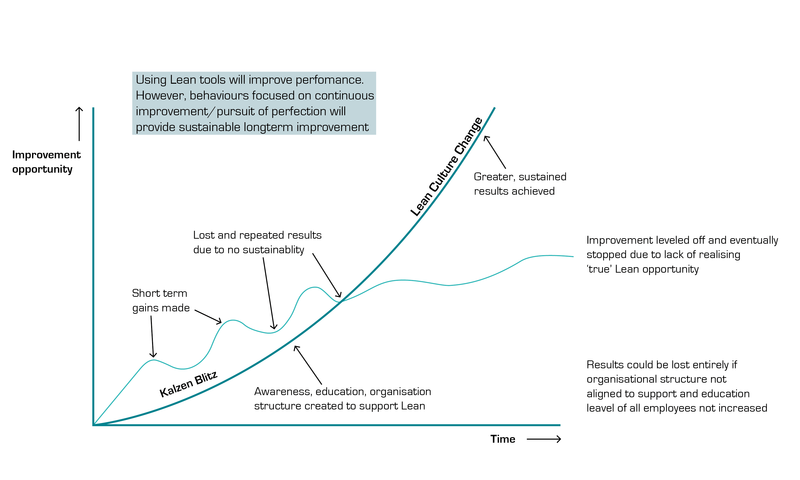 Whilst Lean tools will improve performance, embedded continuous improvement culture is the secret to sustainable long term improvement and the pursuit of excellence.